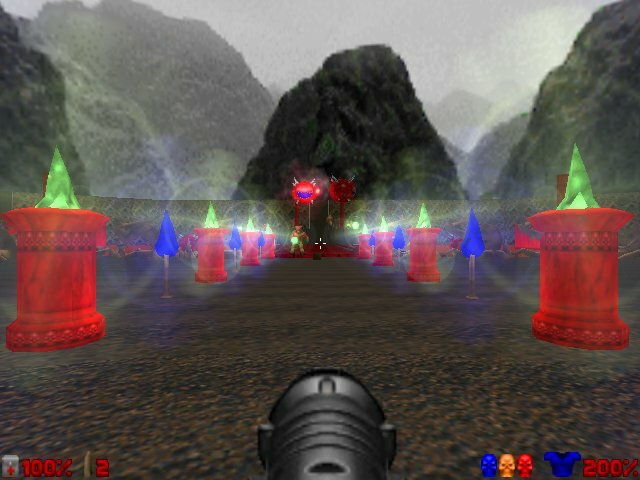 You have got to try out jDOOM !! Holy Monkey !! I just got turned on to this by my bud Dax, and let me tell you, it ROCKS !! If you think of the old days in terms of Doom, Hexen, and Heretic, read on..
Now you can dust those puppies off and they look NICE ! Here's a screenshot from one of my levels. Tell me what looks different with this picture. All of the monsters, items, shots fired, etc. Head on over to the jDoom home and grab it.